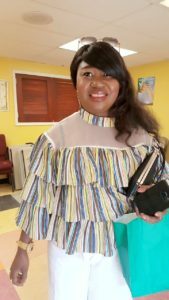 Caregiver of the Month August 2017: Patience O.
Patience is a sweet, loving person who truly understands what it means to be an amazing caregiver. You can always count on her to show compassion and understanding as well as think quickly on her feet in tough situations. All of her clients love her and we at Georgetown Home Care are so happy that she is part of our family. We asked Patience a few things about being a caregiver, here is a summary of what she said. The most rewarding part of my job is putting a smile on my clients’ face, knowing I am providing great care, support and comfort to them. I admire them so much, especially their strength and kindness towards me. I believe in having a positive impact on people so I always work hard to provide the best care possible. As far as being part of the Georgetown Home Care team, I love that the company is well organized and cares not only about their clients but their staff as well.